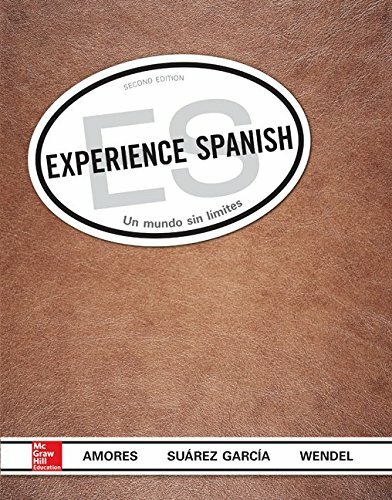 73534447 – Experience Spanish (Student Edition) by María Amores Dr.
Culture is core: Culture is infused throughout the program. The students; cultural experience and exposure is not limited to special cultural sections, but rather embedded in presentations as well as in vocabulary and grammar practice. The dedicated cultural sections are rich and varied: Entrada cultural, Expresiones artisticas, Notas culturales, Notas interdisciplinarias, Lectura cultural, Concurso de videoblogs, Conexiones culturales en vivo, and Conexiones culturales. These readings, videos, notes, and fine art presentations offer students extensive cultural perspectives and promote cross-cultural comparisons and connections. Personalized experience: No two students are alike. Why should their learning paths be? LearnSmart uses revolutionary adaptive technology to build a learning experience unique to each students individual needs. Students engage in targeted vocabulary and grammar practice so they are prepared to practice communication in the classroom. To further the personalized experience, we are excited to announce the interactive 3-D game, Practice Spanish: Study Abroad,that immerses students in a virtual study abroad experience in Colombia. Practice Spanish, accessible on laptops and mobile devices, allows students to practice real world language in a game environment that integrates culture, grammar, and vocabulary.